Monthly subscription boxes are all the rage these days, and it's easy to see why. Companies like Birchbox, Flickerbox, BarkBox, and Love with Food capitalize on consumers' desire to try products in categories they're interested in, and deliver those products in neat little packages every month. It's a win-win; subscribers get goodies in the mail and companies have the chance to get their product in the hands of people who are likely to enjoy them, even buy them. 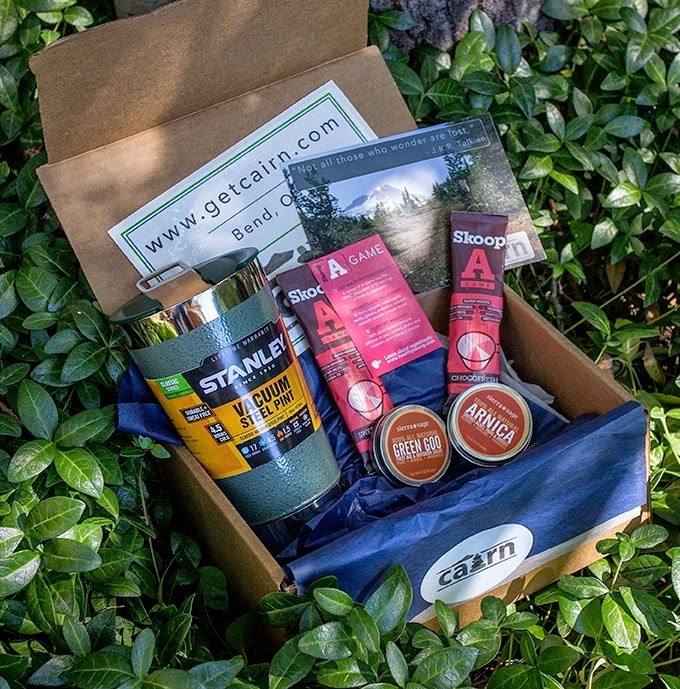 After receiving birthday gift subscriptions to Birchbox, Flickerbox, Craft Coffee (highly recommended) and a few others last year, I lamented at the absence of a subscription box specifically aimed at outdoorsy gear lovers. Oregon-based entrepreneur Rob Little noticed the same hole in the subscription box industry, and through the Bend Outdoor Worx outdoor industry startup incubator, he's working to fill that void with a subscription service called Cairn. This spring, I worked with the team at Cairn to learn more about how monthly subscription boxes work, how the Cairn team chooses the products they include, and what's in it for subscribers. Starting this month, I'm excited announce I'll be partnering with Cairn to take a closer look at the products they choose to send out to subscribers. I'll share highlights and feedback through Cairn's blog to help subscribers and non-subscribers alike learn more about what's in the box each month. We're calling it a "What's in the Box?" Highlight Reel. So whether you're a subscriber, thinking about becoming a subscriber, or just love learning about outdoor products on the market these days, you won't want to miss it. September's highlight reel is live now, and subsequent highlight reels will go up toward the end of each month. Are you a subscriber to Cairn or other monthly boxes? If you're not, do you think hearing more about what's in each box will help you decide whether you want to become one? I'd love to hear from you! Thanks to Cairn for the opportunity, and for sending me complimentary subscription boxes to try. Though I'm not compensated monetarily, I do receive complimentary gear as part of this partnership, but as always, my opinions, (which I'm never short on), are my own. I started my subscription after reading about it here earlier this year. I love my Cairn box! That's awesome, I'm so glad to hear it! I'm stoked to get mine every month too, there's always such a good mix of stuff. What was your favorite in the September box?